After realizing just how huge my craft stash is I decided that 2017 would be the year of frugal holiday crafting. When I say my stash is huge it is HUGE. Basically what happened was a few years ago I moved and since I was coming almost 800 miles we moved my stuff in first and since we weren’t quite sure yet of what would go where the movers suggested putting things neatly in the garage to move in as we had the time. This, they said, would help to keep the inside of the house from getting too crazy. In all honesty I think they realized just how hard I was taking the move. You see I had literally spent the night before in my own bedroom in my own home for the last time and the whole move thing had suddenly gotten real. I wasn’t at home anymore and I already missed it. So we get my craft stuff in the garage because it is hardly a necessity and it’s neatly stacked in my plastic tubs along the wall. We’ve also got a few things like my sofa that didn’t fit in the living room (womp, womp) and other items and it’s pretty crazy but it’s totally contained. Way to go moving men! The next morning Rob has to get to work and I’m about to start unpacking when Rob lays a truth bomb on me… he didn’t get himself packed up for the move and the movers are going to be at his apartment around 4 when he gets off of work. And he can’t take off of work to do it himself, so… Know what that means for good ol’ me? I put on a bra and head over to his apartment to pack up and realize that it is a disaster. There is no tape, there are just a few boxes and I have to go buy supplies to get him moved. By the time I get back I am just throwing crap in boxes trying to get things ready to move and I have no clue things are about to get worse. As I’m working the landlord comes over wanting the keys because they were supposed to be turned in. Um, what, again? I convince her to give me until 5pm and, long story short, the movers were crazy IRKED because not everything was boxed and it was just a flat out mess. Not knowing what was in half of the boxes from Rob’s apartment they just got tossed in the garage to be dealt with and it went from messy but manageable to insane. The movers tossed armloads of junk that didn’t make it into boxes straight on top of everything because they needed to get it out of the truck so they could get on their merry little way. Over the past 2 years (for real) I’ve been working in the garage as I can and getting things nice and orderly. Just the other day I found a box from the old house with probably 200 pieces of felt in it. I had been crafting with felt like crazy back then and then it just sort of dropped off after the move, like I forgot about it. 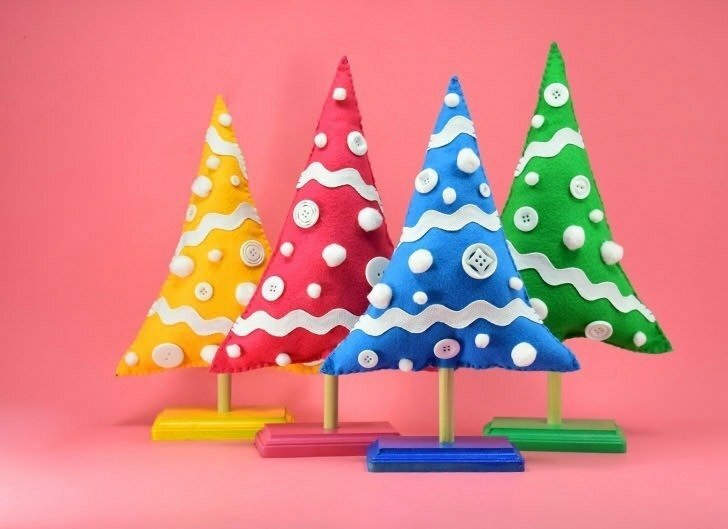 But all of those lovely colors were calling my name and along with a dowel rod and some various white crafty things like pompoms and buttons I made some of the sweetest standing Christmas trees you ever did see. And digging into my ever-growing craft stash (as I get to the boxes) all I had to purchase were the wood plaques I scored for 40% off of $2.99. Not bad, right? These are my plaques I scored for only less than $2 with tax and less 40% from the Hobby Lobby coupon. 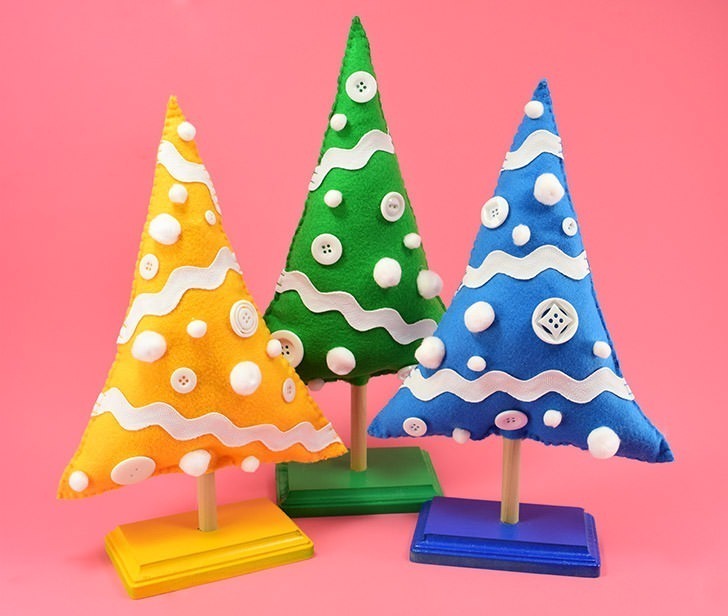 We’re going to use the majority of a regular piece of acrylic craft felt making these 3 inch by 5 inch sized plaques the perfect size to act as a sturdy stand for our felt Christmas trees. 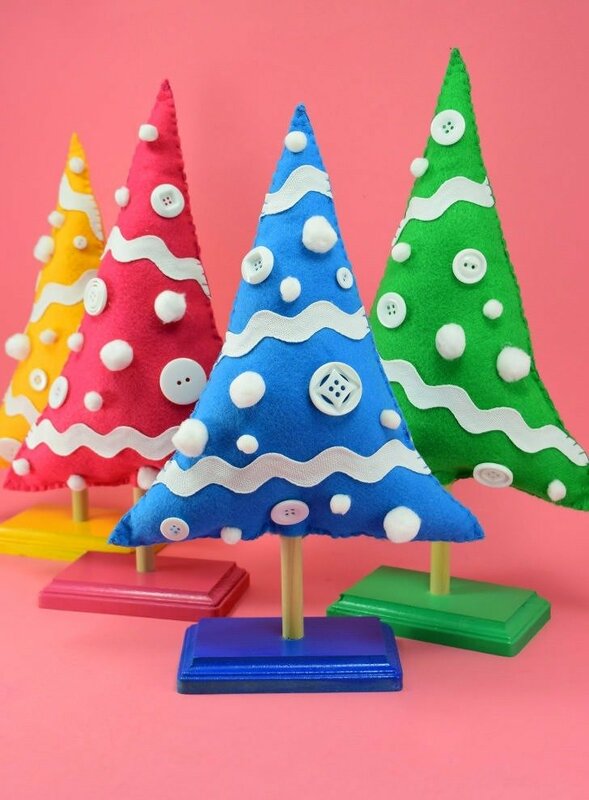 Using bright colors, paint your wood tree bases to match each of the trees you’re going to sew up. I went yellow, pink, blue and green because I had both felt and spray paint already in the stash that matched up really well. And it gave me 2 cool and 2 warm colored trees for a nice balance hue wise. 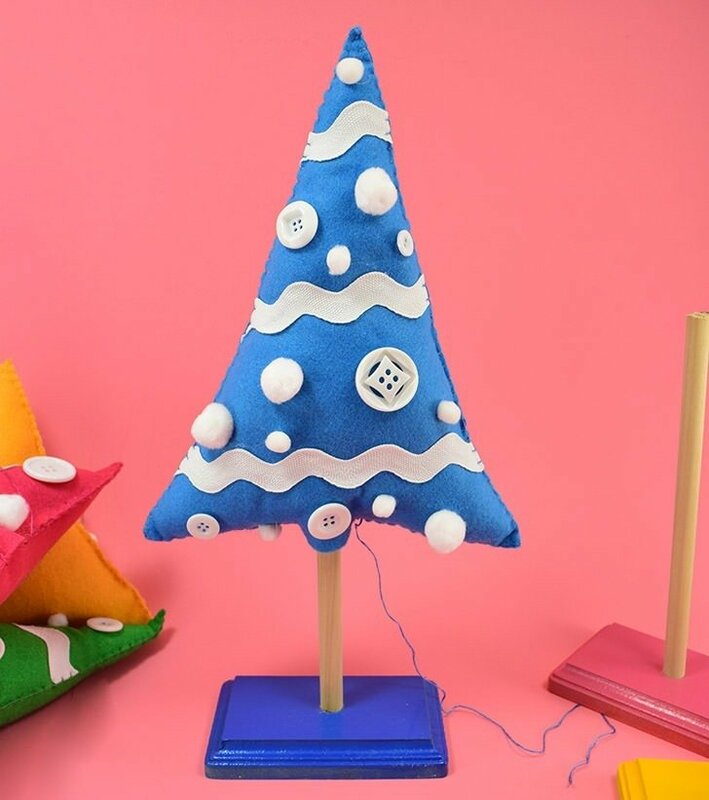 Using a straight edge and a marker place a dot in the middle at the top (or wherever you want the peak of your tree to be) on your felt piece.Using the straight edge draw a line from that dot to the corners of the felt. 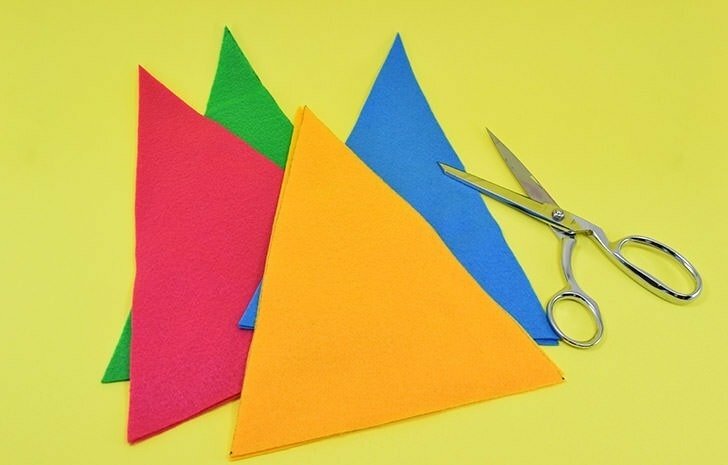 Put 2 pieces of the same colored felt together as neatly as possible and using sharp scissors trim the triangles out. 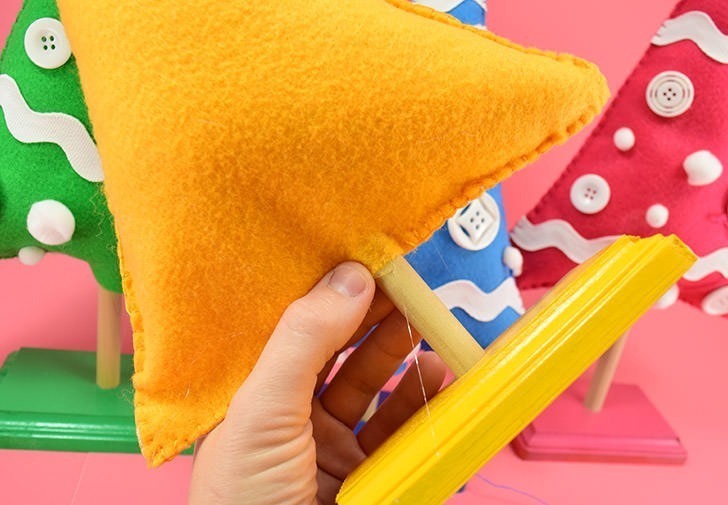 Using hot glue or embroidery floss and a needle tack on the craft stash ornaments onto the front side of one (or both if you will be displaying in an area where both sides will be visible) felt triangles. 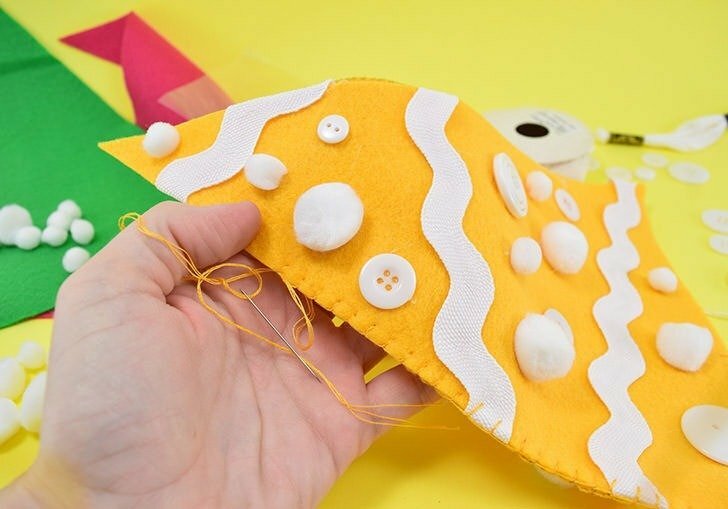 To prevent ugly fraying on the edges wrap ribbons and rickrack and similar things to the backside of the triangle and tack down. 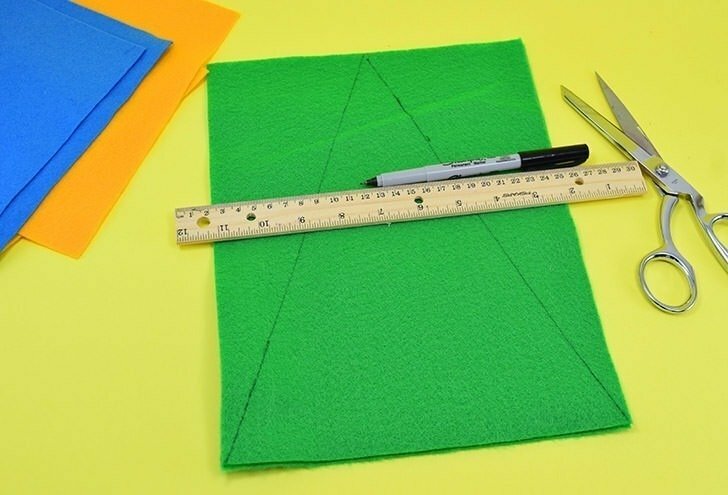 Place your 2 felt triangles together, pretty sides out, and blanket stitch together leaving a sizeable open area along the bottom unstitched. 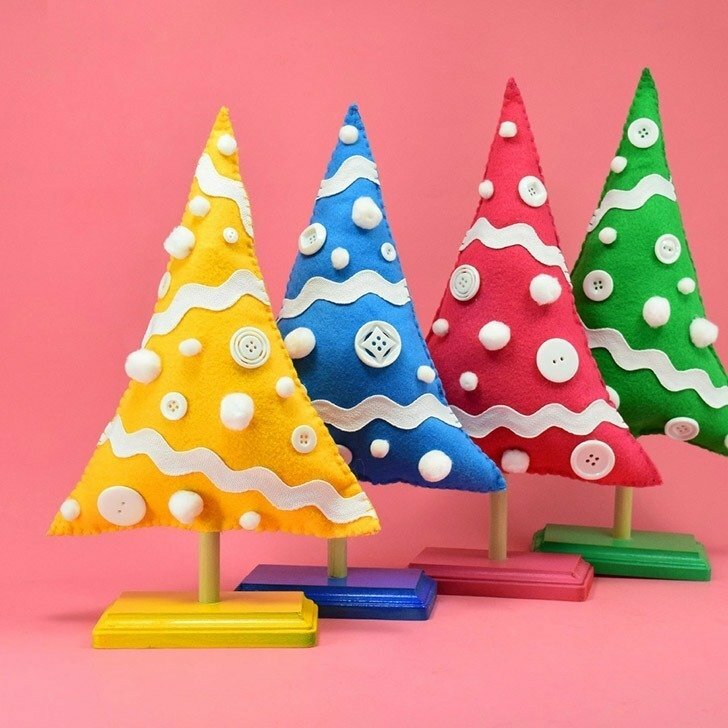 With the gap you’ve left open shove polyfil into the tree to make it nice and puffy. Heads up, over-stuffing will make these things look crazy for some reason. Just a light about of filling seems to work best for this design. 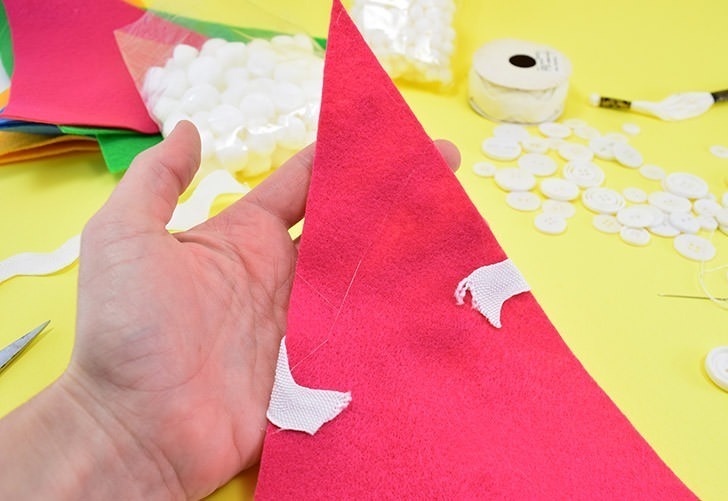 FYI, if you do not have Polyfil on hand you can always remove the stuffing from an old pillow. I do this so I can get new pillows, ’cause who doesn’t love a fluffy new pillow, without wasting the old ones! Let’s just take a quick break to marvel at HOW CUTE these things are turning out to be, am I right? 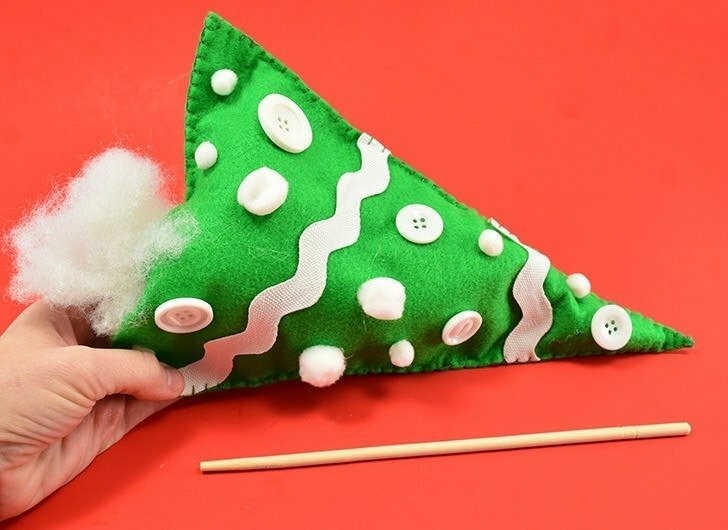 After stuffed stitch the bottom until you have an opening large enough to accommodate the wood dowel to attach the tree to your wood plaque base. 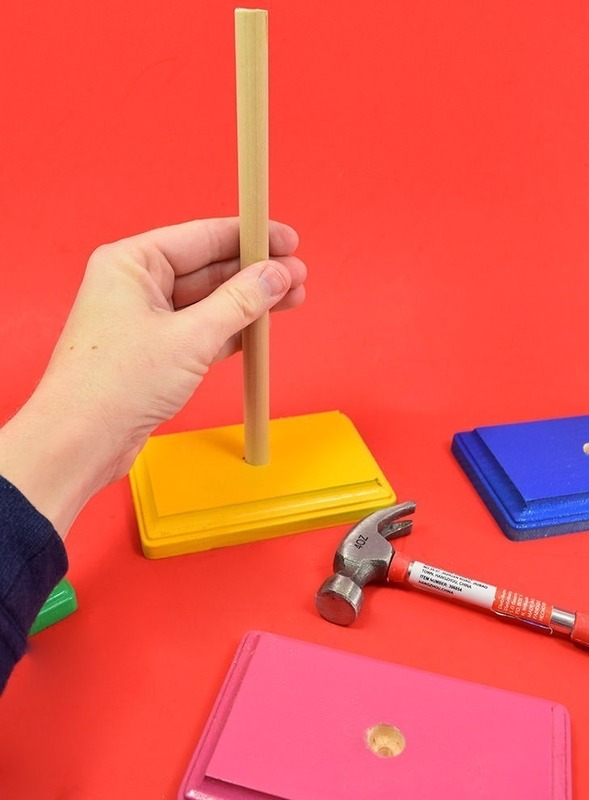 Trim down a wooden dowel into 9″ lengths (I cut a 36″ dowel into 4 hence the 9″ measurement, finagle this number as you need to with what you have). Measure the center of your wood plaque and mark accordingly. Using a drill bit that matches the size of your dowels (mine are 1/2 inch dowel and 1/2 inch wood bit) make a hole in the center of your base that goes almost, but not quite all of the way to the bottom of the plaque. See how you can see a tiny bit of background through my hole? That’s perfectly fine and necessary to use that kind of bit to make the drilled hole deep enough to hold onto the dowel well. 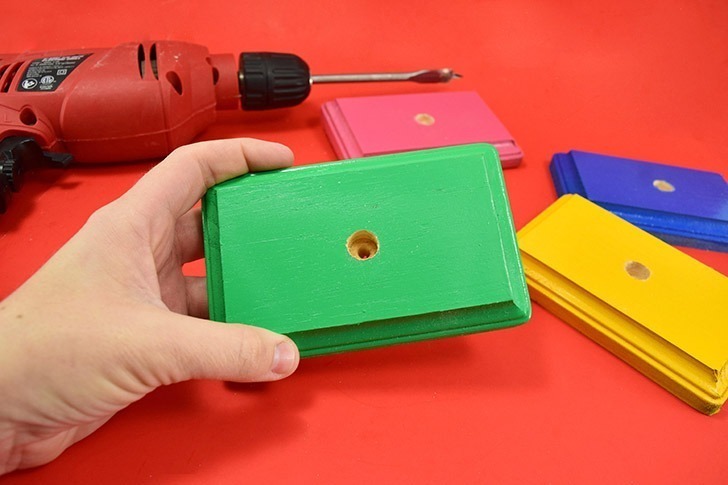 Using the same size dowel and bit means you can tap the dowel into the plaque for a wonderfully perfect fit BUT if you find that your dowels are loose add a little bit of wood glue inside of the holes to keep the dowels firmly in place. 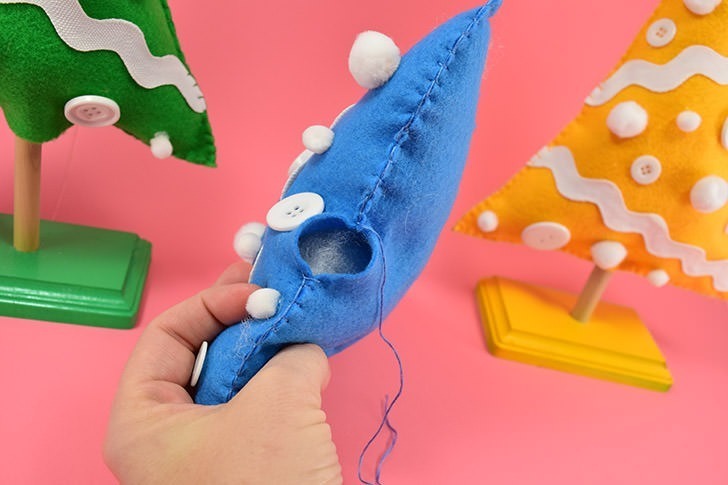 Slide the felt tree onto the base with the opening you have left free. p.s. at this point you want the end of your thread already dealt with so have that cleanly snipped up unlike what you see in the pic above. Oh my goodness they are so stinking cute and cost me less than $2 because I raided my insane craft stash. Do you love it? Luckily if you don’t hoard and move without unpacking for years like I do, everything you see here is so inexpensive to purchase. 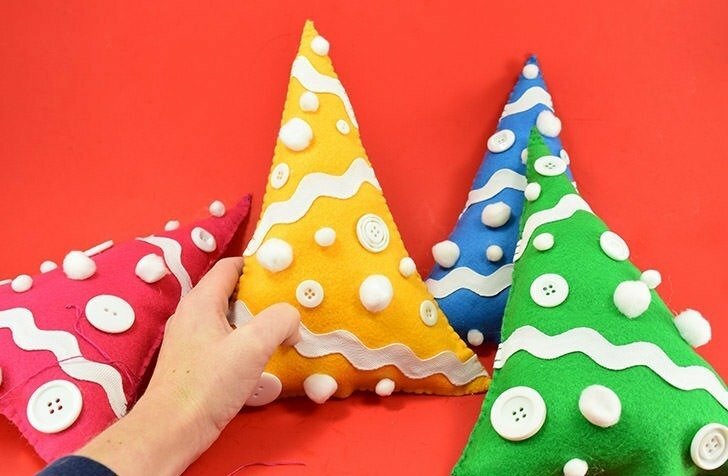 Let’s run the math assuming you don’t use any coupons to purchase all of your items to make 4 like I did… each tree takes 2 pieces of felt at around $0.25 apiece for $2.00. Matching floss will run around $0.40 apiece for $1.60. 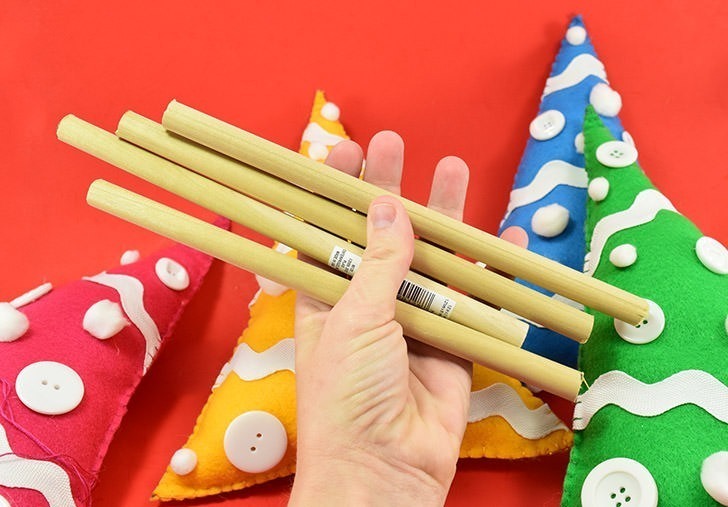 A 1/2″ wood dowel can be cut into 4 requiring the purchase of only 1 will cost $0.99. Four bottles of craft paint, running around a dollar apiece will be another $4.00. 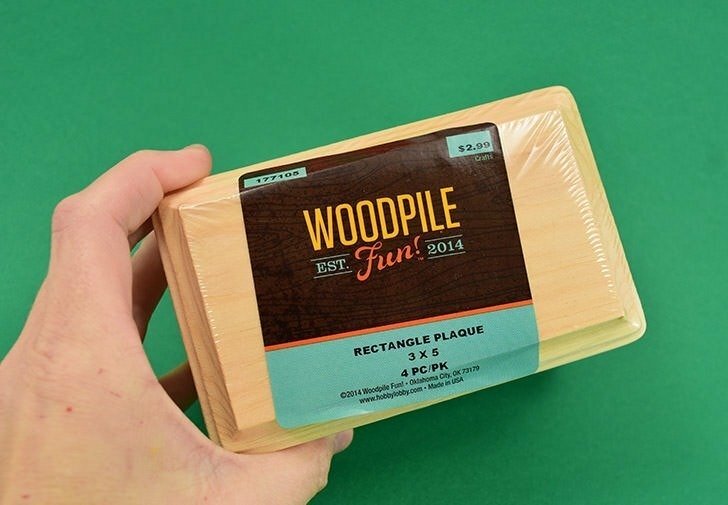 A package of 4 wood plaques will run you around $2.99. 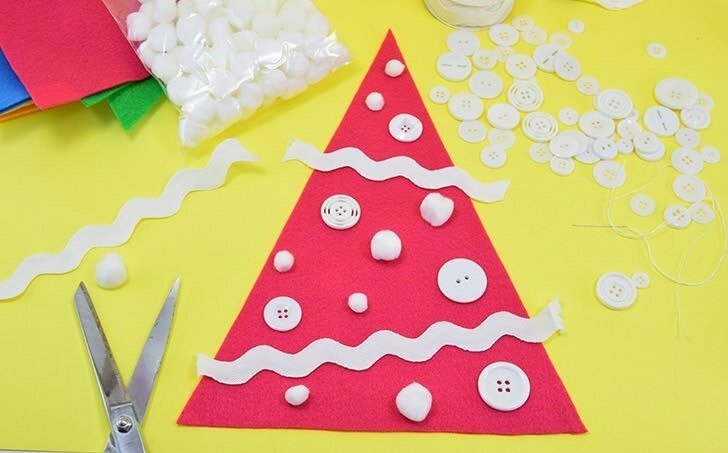 Pulling the ornaments from your craft stash of buttons and poms and lace and ribbons (if you’re here at a craft blog I KNOW you have something going on stash-wise :) which brings our total for 4 amazingly colorful DIY Christmas trees on stands to cost of $11.58 before tax. That’s pretty good, right? I’m going to say yes and HUZZAH! These are so cute! 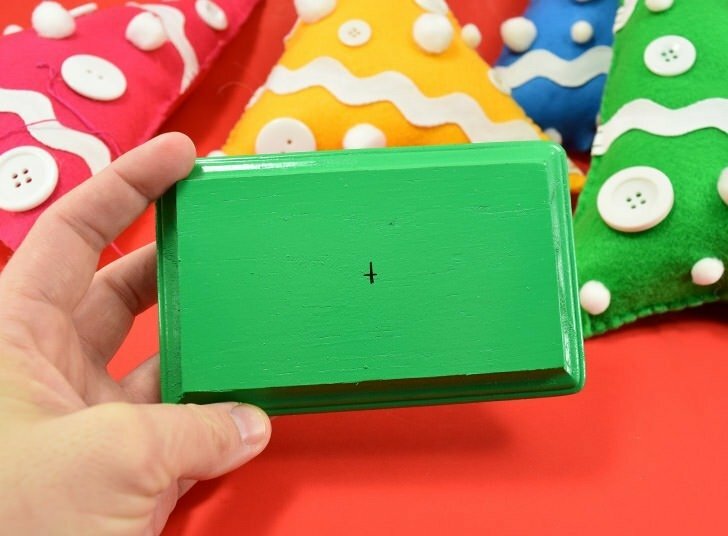 I love that you used all the colours instead of just traditional Christmas colours.